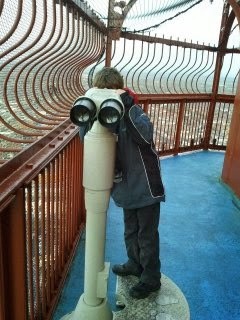 During half term we visited Blackpool. 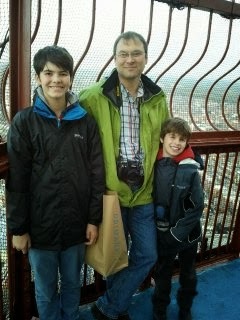 I have never been up Blackpool Tower before so we decided that it would be fun to go up the tower. 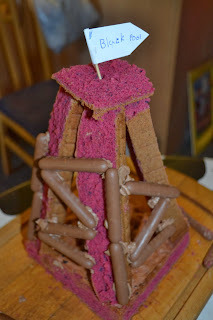 Obviously this isn't the real Blackpool Tower, earlier this year William entered a competition and made a model Blackpool Tower out of cake. 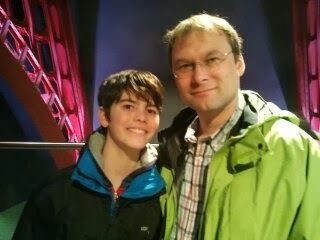 Unfortunately he didn't win but the organisers kindly sent a family ticket to visit Blackpool Tower which we used last week. The first part that we visited was the 4d theatre where we followed a little boys experience of the seaside. Not only did we see his adventures the film was brought to life with real wind, rain and sunshine! The 4d theatre was great and the boys loved it. After leaving the theatre we went in the lift up to the skywalk which is glass floor that you can walk on. We all stepped on it and looked at the fantastic views. From the skywalk you can climb up a couple of flights of steps and look out over the sea, it would have been nice to be at the top of the tower once the illuminations had been switched on but we were a bit to early for this. We had planned to visit the circus however the 4pm show was fully booked with it being half term. The tickets are valid until the end of the year so we will visit the circus another day. 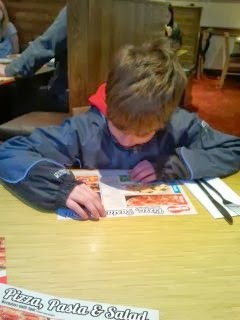 We had promised William and Luke that we would have tea out so we found a Pizza Hut restaurant and ate tea whilst we were waiting for the illuminations to be switched on. We walked a long way down the front looking at the illuminations and for once Luke didn't moan about the distance we walked as there was so much to look at. The decorated trams looked amazing and really added to the atmosphere. We had a lovely day out and can't wait to go back and visit the circus.